Paul A. Loeffler was born on December 4, 1928 in New Ulm, Minnesota to Alois and Bertha (nee Kuehn) J. Loeffler. He died Friday, October 12, 2018 at Greek American Rehab & Nursing Center, Wheeling. Before retiring Mr. Loeffler was a promotional services supervisor for Moore Business Forms. 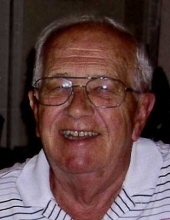 He was an active member of St. Mary Parish where he was a member of the Men's Club, former president of the St. Vincent de Paul Society, and a past Grand Knight of the Knights of Columbus. Paul is survived by his children Julie (Dennis) Eaton, and Greg (Sandra Jefferson) Loeffler; his grandchildren Michael (Samantha) Eaton, Amanda Eaton, and James (Meredith) Eaton; his great grandchildren, Lexie, Ella, Gage, Harper and Hazel Eaton; and his brother, Austin Loeffler. He was preceded in death by his wife, Mary, his parents, and his sisters, Marcella Groat, Joan Koppe and Laura Hurley. Visitation from 10:00 am until of Funeral Mass at 11:00 am, Thursday, October 18, 2018 at St. Mary Parish, 10 N. Buffalo Grove Rd., Buffalo Grove, IL 60089. Interment St. Mary Parish Cemetery. In lieu of flowers memorials may be given to St. Vincent de Paul, or Knights of Columbus, Bishop Ketteler Council #1628, C/O St. Mary Parish. "Email Address" would like to share the life celebration of Paul Albert Loeffler. Click on the "link" to go to share a favorite memory or leave a condolence message for the family.